There are many, many rules to kimono wearing in Japan, though few Japanese know the rules now and relatively few experts ever knew them all. The list is vast and the rules complex. Some rules are better known and more adhered to than others; among them, the colour combinations worn at different times of year. Further down this blog post, below the charts of colour combinations, you can see the Japanese names for colours. The colours may display slightly differently on different monitors, so it is a rough guide. The first colour chart below shows colour combinations that are considered acceptable for wear at any time of year. Below each is the name given to that particular combination of colours, although I don’t know the name of the last one in that first set. The next set of colour combinations is only for Spring wear. When Summer arrives, one may wear the following colour combinations. The advent of Autumn allows the colours in the next chart to be worn. Finally, the range of colour combinations that may be worn in Winter. Here is another set of seasonal layering colour combinations, with the individual colours named. 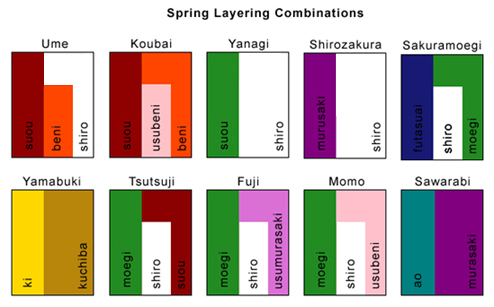 The following charts show you Japanese names for colours. There are endless rules about kimono wearing. The older a woman is, the more subdued the colours she must wear. Therefore you’d not see a mature woman in something like bright red. One way to produce a more subdued tone for a mature woman’s kimono is to dye the textile a bright colour, then re-dye it in a light, mouse-grey tone, to subdue the brightness; this is rather cutely known as ‘through mouse’, so a subdued pink would be pink through mouse. Then there are the styles of kimonos, which have different levels of formality and are worn for different occasions, such as town wear, festival wear, visiting wear, formal wear of varying degrees etc, and a mature woman or a married woman would never wear a furisode style kimono, they are only for unmarried women who are still young. Other rules apply about differences in how a woman wears her kimono depending on her age; such as the position of the kimono’s collar at the back of the neck, the height crossover of the kimono on the chest and the position of obi, obiage and obijime. The patterns one may wear change season by season too, as, to some extent, does the weave of fabric it is made of and whether or not the kimono is lined. A cool, lightweight, unlined, ro weave silk kimono may only be worn from June to September and neither unlined kimonos nor ones made from that light, airy ro weave may be worn at any other time of year, regardless of how hot it often gets before June. When it comes to patterns, cherry blossom is a good example of the rules; one may wear cherry blossom just before the trees flower but, once the trees are in bloom, one should not wear it anymore but one can then wear falling cherry blossom petals design, until the petals do start to fall, then one should stop wearing any cherry blossom pattern until the following year, shortly before the trees bloom again. There are some specific groups of flowers that are considered acceptable for most of the year, so those kimonos are more popular, as one gets more wear out of them. Kimonos are so expensive that few can afford the luxury of owning ones with patterns that may only be worn a few weeks a year. The list of rules goes on and on. With enough knowledge of them, one should be able to pretty much pinpoint the age and status of the wearer, what kind of place/event she is going to and what season it is, just from the kimono outfit she is wearing. In Japan, regular kimono wearers used to know many of the rules but only relatively few true experts (such as iki suji) would know them all. Younger generations in Japan, who rarely wear kimonos nowadays, know few or none of the rules and completely rely on a kimono expert to both know the rules and to actually dress them in their kimono outfits on the rare times they wear them for special occasions. The word that means ‘the putting on of kimono outfit’ is ‘kitsuke’ and one can hire the help of someone for their kitsuke. One very important rule you must never forget if wearing a kimono in Japan is ‘left over right’, meaning the left front of the kimono must be on top of the right front, on both males and females, because the other way round is only for the dead. The Japanese say that a way for English speakers to remember is to think of ‘left over rice’. This is my only kimono I can pin down to a month currently, most are split into the 4 season or multi-season! In Japan it is about £100 to be dressed in your kimono by a shop so it is normally reserved for ceremonial occasions when you want something fancy. Hello, my name is Charlotte and I’m a University student studying Japanese culture. I’m actually in the process of researching for my dissertation and my topic (Japanese aesthetics in contemporary Japan) involves the discussion of seasonal colours and combinations. I was wondering, if you could kindly tell me where you found the information above? If it is your own research, could I possibly use some of the information in my dissertation, with full crediting of course. Sorry if this isn’t possible. I love the blog, it’s really informative. I just learned it, bit by bit, over the years, through books and internet research. Feel free to use any of the information or images in your dissertation. If you want a glossary of Japanese, traditional motifs/patterns, for your studies, give me your email address. The file is large (8-9MB), too large to email as one file, I think, but I can convert it into half a dozen pdf files and send one per mail. Let me know if you want it. I assume I can send it to the email address you have on here. Good luck with your studies, Charlotte..
I’m so sorry for the late reply. Thank you so much for allowing me the use of your precious research. It is greatly appreciated. Any information you could send me would be really great. My email is the one on the comments. Take your time if you’re busy. This is ages after the fact, but would it be possible to also receive this glossary? It is only a matter of personal interest, not of academic research, but I would be very much interested in it. You mean this page about colour combinations? I don’t have a downloadable/email-able version of it but you can copy and paste from the blog into something like a Word document. You should be able to right click and copy the pictures if just selecting and copying everything on the page leaves those out. Ah, I think you mean my list of patterns. I don’t have those pdf files anymore, I’m afraid. I was wondering, do you happen to know specifics regarding the system of layering for the Junihitoe? I know it was fairly complex and specific for court ranking, but I don’t even know where to start looking. I don’t know much about the rules of layering from that time. It was very complex, I understand, and knowledge of it took much study and was highly admired. The rules of kimono wearing that are still in use are too many for me to know all, I know even less about rules and fashions of the past, I only know little bits and pieces. Hello! I have two questions. 1.) Maybe it’s just because I’m very new to this, but especially in the three-color arrangements you have, I can’t figure out which colors should be the under-layer and which should be the over-layer(s). Could I request a quick explanation? 2.) If the research you sent Charlotte is still available for sharing, may I request a copy as well? I don’t know that information either. The rules of colour and of colour combination and layering are very complex and, as I can’t read or speak Japanese, I do not find it easy to get information on such things, though most Japanese don’t know the rules either. Pretty much all I know is what I posted. I’m afraid I can’t remember sending someone research, it must have been some time back. I doubt I still have whatever it was. Two of the colour combinations in your great chart are unnamed. Is it because you identified the combination from visual sources, but they have no specific names in literary sources? Some years ago you offered a large (8-9MB) a glossary of Japanese, traditional motifs/patterns file to Charlotte for her research. Could you please sent this file to me also? I seem to have cropped off the bottom of that image and no longer recall what that colour combination is named. I’m afraid I can no longer find that file about Japanese motifs, it may be on some back-up drive but I have been unable to find it.. Perhaps you can get a copy from Charlotte.